The first issue of The Scots Magazine was the January issue, published on 9th February 1739 as a 48-page pamphlet, price sixpence monthly. It was edited and printed in Edinburgh. Throughout the 18th century it prided itself on its news service, both foreign and domestic. Long parliamentary reports were published, the names of speakers being given fictitiously, this being a device to circumvent the ban on the reporting of parliamentary proceedings. Through its pages the people of Scotland often obtained their first news of major events involving their country. Among such was an account of the defeat of the Jacobites at the Battle of Culloden in 1746. The sympathies of the magazine, and of most people outside the Highlands, were with the Hanoverians. In the early years of the 19th century the influence of the magazine declined, owing largely to the livelier editorial policy of newcomers, such as Blackwood's Magazine. 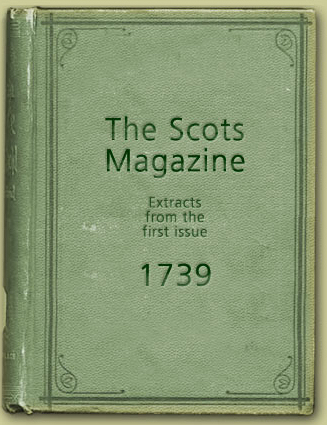 In 1826 The Scots Magazine ceased publication. The title does not appear to have been used again until 1888. The Scots Magazine was published from then until 1893, the printers being S. Cowan, Perth. The magazine, much the same size as at present, had apparently been published for two and a half years as The Scottish Church before reverting to The Scots Magazine. In its present form, The Scots Magazine dates from April 1924 when it was re-established by the St Andrew Society (Glasgow) as the official organ of the Scottish Societies throughout the world. The firm of D. C. Thomson & Co., Ltd., Dundee, took it over in April 1927, since when it has been published continuously. The Scots Magazine is widely read in Scotland and among Scots overseas. Many visitors to Scotland find that it appeals to them, and become subscribers. The object of the magazine today is to present a picture of Scotland as a nation. We seek to keep alive the best of our traditions and to remember the history that has made Scotland distinctive. We provide authoritative articles about the Scottish countryside and its natural history, and in recent years there has been an emphasis on top-quality colour photography. We also publish short stories and reminiscent articles which bring out the flavour of Scottish character. With a multi-national readership of over 190,000, The Scots Magazine is the world's best-selling Scottish-interest publication. D. C. Thomson & Co., Ltd., are also know for The Dandy and The Beano and also Oor Wullie and The Broons as well as The Sunday Post newspaper and other publications in there over 100 years in business.